Established over 10 years ago and positioned in the heart of Theatreland, Palm Court Brasserie brings a continental feel to Covent Garden. Palms is popular with locals and attracts residents as well as a loyal business following at lunch and supper times, where they mingle with the pre and post theatre crowd. The menu is a carefully chosen selection of French-Mediterranean fare with daily specials that embody the brasserie values of good food, simply cooked and fairly priced. The wine list is an all-embracing spanning the best vineyards of France and Italy and is complimented by a range of freshly squeezed juices and cocktails. Palms is the restuarant for every occasion, being a drink after work, a business lunch, a romantic dinner or a buzzing party. The restaurant can hold up to 140 for dinner and 200 for a drinks reception and the private suite can be hired independently holding up to 40 seated and 60 standing. 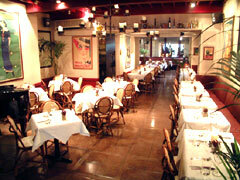 The pan-Mediterranean menu has something to offer to everyone in this relaxed and elegant restaurant. The restuarant being a walking distance from most West End shows, a perfect place to start the evening with a few drinks and the Palm's popular pre-theatre menu.